It’s the third day of CLAMP theme week! As you may or may not know, CLAMP is a very prolific group and to date they have well over 20 series, many of which have very different themes, plot, and even art style. Their tendency to experiment with different art styles merits a post of its own, but even without that it can be daunting for a beginner to know where to start. 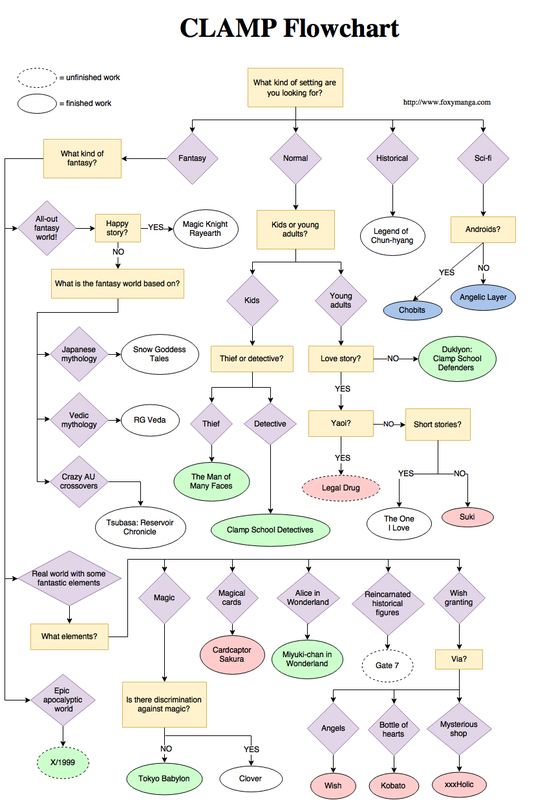 So with that in mind, I’ve created a large flowchart to help you decide which CLAMP series to read. 🙂 This was inspired by The Ultimate Anime Recommendation Flowchart, which I also recommend as a good resource for anime enthusiasts. Color-coding: The background color of the series indicates that they are set in the same universe, though the timeline of events in one series may be hundreds of years in the future or past of another. Tsubasa: The reason I did not choose to color-code Tsubasa is because technically, the world that Tsubasa starts in is NOT the same world as any of the others, not even xxxHolic (it’s made quite clear that xxxHolic is in a different dimension). While Tsubasa’s characters does journey across many worlds and occasionally come across the other CLAMP “universes,” I made this decision based on Tsubasa’s original world.